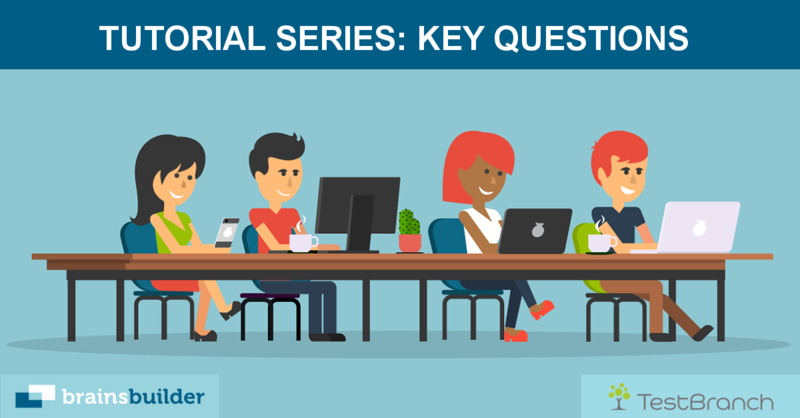 In this the second part of the tutorial series we will look at ‘key questions’ which are special type of login question. In the first part of the tutorial series we looked at ‘login sections’ and ‘login questions’. If you have not read the previous part we suggest that you read it before reading this as it will give important background information regarding ‘key questions’. So what exactly are key questions and why are key questions important? If you have created a Brainsbuilder assessment you will know that all Brainsbuilder questions can consist of two parts to the question i.e. multiple choice part and a free text input part. Key questions must be login question that only only a free text input part. The name and email address key fields are created automatically for you along with the login section if you select the ‘Email’ or ‘Full Name’ login questions. Key questions help you identify the people who have answered an assessment. This is useful when looking at the assessment results and you need to know who took each answer. You can have up to a maximum of 3 key questions set. 1) It must be created in the login section. 2) It must consist of only a free text input part. 3) It must be answered i.e. (it must be validated) therefore it cannot be skipped. When you have created the question you can then set it as a key question on the “Assessment Settings” screen. Scroll down to the “Key Questions” tab and click “Open” you will see which questions are set as your key questions and you can amend them here.